Back in Stock: The new Kaset instant rice porridge (or 'congee' see our Thai porridge recipe). This really fills up your stomach and tastes great. Kaset is a Thai company doing many modern things to meet current market trends for healty, nutritious, all-natural foods. Our Kaset brand bean thread noodles are all-natural, and we believe the best bean thread in the world. Their products have excellent quality overall quality, without a lot of unnecessary packaging. The porridge comes in a simple paper cup, like a coffee cup, rather than foam or plastic. Peel back the foil top and there is a small spoon inside together with a packet of 100% pure jasmine rice and natural spices. Simply add hot water, stir, and it's ready to eat (no waiting). The instructions in Thai say it tastes more delicious as you stir it more, so take your time and stir, enjoy the aroma of your healthy meal. You get 2 cups for $4.95, each 30 gram cup is almost a meal itself. Add cooked meat or egg if desired. Ingredients (seafood): dehydrated rice, dehydrated fish, salt, sugar, soybean protein flake, spring onion flake. Ingredients (chicken): dehydrated rice, chicken soup seasoning , salt, sugar, dried chicken, spring onion flake. Ingredients (pork): dried jasmine rice, egg powder, pork soup seasoning, iodized salt, sugar, dried pork, spring onion flake. My friend from Norway grew up on a fish porridge his mother used to make all the time and he said your Joke Cup tastes exactly like it. Would not stop going on about it so I was impressed enough to drop you a line. I could see that it was simultaneously a fond memory and yet frustrating as I believe that was like how I feel about chicken. One eats too much of a thing for too long a time and well... After the hiatus' however, it is as a warm memory of nostalgia and joyous reflection. For myself, I just thoroughly enjoy Thai food and I can't figure out why. I don't look the part I suppose. We have spoken on the phone in the past. vThank you for your graciousness. I am still interested in the Cooking trip.vvvI don't know why but I am drawn to this. Best new year wishes. 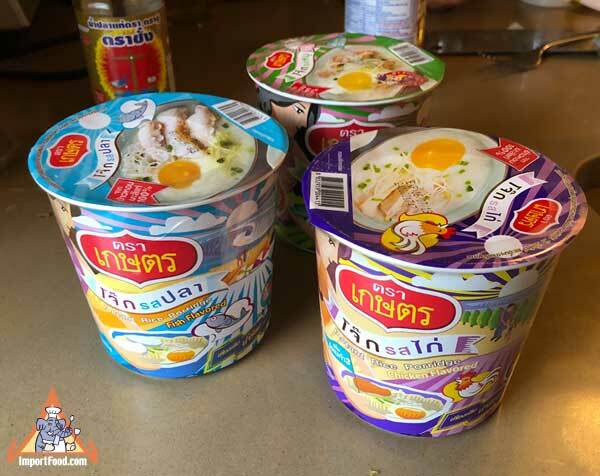 Porridge soup (or "Joke" in Thai) is very popular throughout Thailand, and our customers are very happy to know it's now available from top quality producer Mama brand. Here is our recipe for porridge soup (congee) which is quite time-consuming. With this convenient Mama brand instant porridge, just add boiling water to the cup (plastic spoon included) to make a delicious porridge. Add sliced fresh green onions and/or a whole egg to add flavor. You get one case, with 12 individual cups inside. We have pork flavor and seafood flavor. Most customers love both. Ingredients, chicken: dehydrated rice grain, rice flour, sugar, salts, msg, non-dairy cream, yeast extract, dried leek, vegetable flavor (soybeans, wheat, spices), disodium 5. Inredients, pork flavor: dehydrated precooked rice flake, rice flour, salt, sugar, msg, artificial pork flavor (soybeans, wheat), dried leek, non dairy cream (glucose syrup, hydrogenate palm oil, sodium caseinate), pepper powder, dried ginger, garlic powder, disodium 5. We like topping this with fried onion.